The Elements Series<sup></sup> provides an expanded choice in Fashion Doorware at an affordable price. In decorating your home, choosing the right paint, wallpaper, tile and trim is important in creating a personal design. The Elements Series of Fashion Doorware will support and enhance your decorating decisions. Simple, elegant, and clean, the Fairfax knobs fits snug in the palm of your hand This half-dummy, or trim function, is surface mounted on doors where only a pull is required. The complementary Antique Brass finish offers a warm feel with deep accents in the contours of the product. Welcome Home Series<sup></sup> handlesets are the perfect addition to your front door to create a unique and fashionable entryway to your home. Each is stylishly designed to provide maximum-security protection. There are many styles, finishes and configurations from which to choose.The Huntington is distinctive in its beauty and grace. It lends the perfect finish to almost any door. This passage knob/lever is best used in interior hall and closet applications where no locking is required.The knob/lever is reversible and mounts on both left and right handed doors. The complementary Antique Brass finish offers a warm feel with deep accents in the contours of the product. Baldwin has a 60 year legacy of craftsmanship and innovation. Rated #1 in quality by builders and contractors, Baldwin is pleased to offer a line of luxury hardware for the discriminating consumer, our Prestige Series. Feel the difference - Baldwin hardware is solid throughout. With a 60 year legacy of superior style and quality, Baldwin is the choice for an elegant and secure presence. The classic round shape and intricate lines of the Alcott knob complement and enhance a variety of design styles. The Polished Brass finish adds to the traditional look and feel of the product and makes a classic statement. The dummy, or inactive function, is surface mounted on doors where only a pull is required. 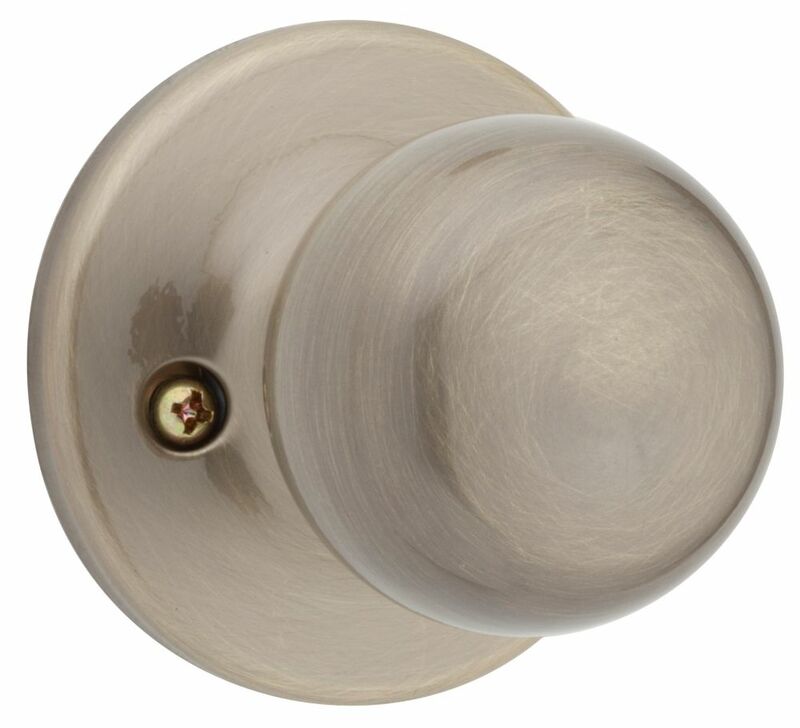 Fairfax Dummy Knob in Antique Brass The Elements Series<sup></sup> provides an expanded choice in Fashion Doorware at an affordable price. In decorating your home, choosing the right paint, wallpaper, tile and trim is important in creating a personal design. The Elements Series of Fashion Doorware will support and enhance your decorating decisions. Simple, elegant, and clean, the Fairfax knobs fits snug in the palm of your hand This half-dummy, or trim function, is surface mounted on doors where only a pull is required. The complementary Antique Brass finish offers a warm feel with deep accents in the contours of the product.